A: We can promptly remove stains with either outside window cleaning (for four-storey properties), rope access window cleaning (for high-rise properties), or via the usual manual cleaning of interior casements. A: Certainly! This equipment can stretch up to 22 metres in length, allowing the team to easily reach and wash even the farthest corners of your panes. A: Our water is distilled from any residue-causing impurities. When this liquid disappears under the sun, it won't leave any streaks behind. A: Rainwater is usually unpolluted, so it won't deter us from doing our responsibilities. However, while we won't have anything against a slight sprinkle, a sudden rainstorm can bring unsatisfying results. During thunderstorms, we may have to put off our service for a day of your choice to ensure the technicians' safety. A: No, the practiced window cleaners in Marylebone can easily perform external window cleaning in your absence, as long as your property gates are unbarred. And if you want your casements to sparkle on the inside, just opt for our free of charge key pick-up and delivery alternative instead. With window cleaning in Marylebone, you'll give your panes the professional clean they deserve... at custom-tailored price rates that will stay within your budget! Don't believe us? Chase away your doubts by taking a look at our price table below. 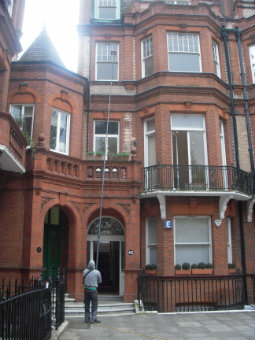 We've created our window cleaning in Marylebone with versatility in mind. As a result, our service is now regularly booked by commercial and residential clients alike. Let's have a look at our window cleaning choices on offer. With our exterior cleaning, you can easily polish the casements of any domain with four or less floors. The proven adepts will arrive in a cleaning caravan. The window cleaners in Marylebone will then link a handy water-fed rod to the van's water storage. The special filtrated water will be released through a brush-head installment at the pole's end under high pressure. When the fluid evaporates under the sun, your glass façade will stay smudge-free for weeks to come. For properties above the fourth storey, we'll send veteran climbers for rope access window cleaning. Carrying durable ropes, cherry pickers, and ladders, they will evaluate and rejuvenate any lofty commercial property over the course of one afternoon. Should you require risk evaluation reports, we'll happily provide them for you. We also take our work to heart and will follow all safety regulations. If your glass surfaces are smudgy on the inside as well, the specialists can carry out inside cleaning with ladders and sponges. In our aim to aid as many Londoners as we can manage, we've expanded our window cleaning in Marylebone to cover extra locations across the capital. For your comfort, we've mentioned the names of these close by locations below. For those of you who'd rather book window cleaning services Marylebone W1 online, fill in our get a free instant quote form.